The Angriest: Outlander: "By the Pricking of my Thumbs"
It is 11 April 2015, and time for another episode of Outlander. When Claire (Catriona Balfe) finds a harmful charm under her bed, she confronts a spiteful Laoghaire (Nell Hudson) - only to find the charm came from Geillis (Lotte Verbeek). Jamie (Sam Heughan) seeks the support of the Duke of Sandringham (Simon Callow) in ridding himself of Captain Randall. Dougal (Graham McTavish) is bereft with his wife unexpectedly dies. It has been almost two years since I last watched an episode of Outlander; not by any specific intent, simply that I kept choosing to watch other things. I suppose that is, if nothing else, a minor indictment on how I find the series. It has a little too much sexual assault - and more often the threat of sexual assault - for my liking, and it gets a little tiresome. Thankfully this mostly self-contained episode steers away from that and into other criminal areas instead. So to take the plot threads in turn: Laoghaire is turning out to be a bigger thorn in Claire's side than previously expected, due to Claire marrying the man she always believed was hers. Laoghaire is a bit of a stereotypical character, but Nell Hudson's performance makes her very believable all the same. She leaves a charm under Claire and Jamie's bed to curse them, but the charm she bought from the local apothecary - and likely witch - Geillis. That draws Claire into thread two. Geillis is pregnant to Dougal McKenzie, brother of the local laird. Both of them are married. When Dougal's wife unexpectedly dies, it transforms their dalliance into a murder mystery. Dougal is such an unlikeable character: he's cheating on his wife here, and a few episodes ago he almost raped Claire. The series weirdly feels like it is trying to run with two characters at the same time, making him awful when they want him to be but a heroic co-star when they need him to be. One is interfering with the other for me, and despite McTavish's strong performance he remains problematic and just a little infuriating. 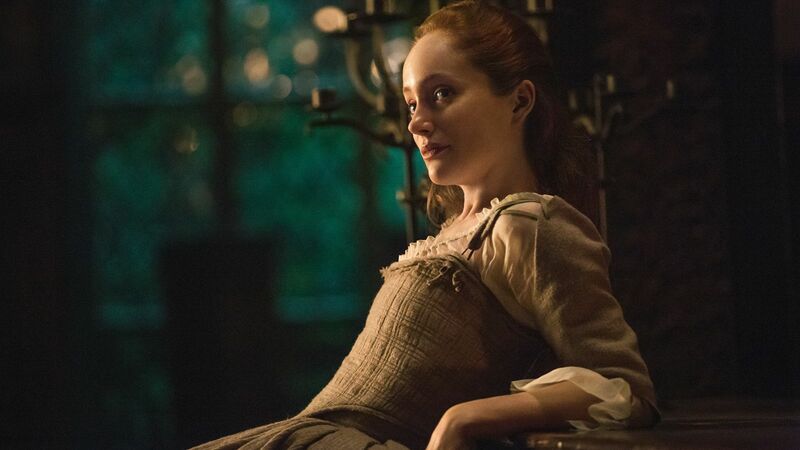 Lotte Verbeek is wonderful as Geillis. She is instinctively untrustworthy, yet tremendously addictive to watch because she seems to know much more than she ever lets on. In earlier appearances I wondered if she was also from the future; this episode leaves me less sure of that. Meanwhile Jamie is seeking the favour of the Duke of Sandringham in ridding himself of Captain Jack Randall. The storyline seems mainly an excuse to have theatrical super-weight Simon Callow guest star as the slippery and comical Duke, and he certainly proves to be a highlight of the episode. In return for helping Jamie he demands the young Scot be his second in a duel with the MacDonalds - enemies of the McKenzies. The duel itself has a lot of good comedy to it, but it remains to be seen if the duel has consequences for Jamie in future episodes. It does see him temporarily banished from his laird's court at Castle Leoch, and that leaves Claire defenceless for the episode's cliffhanger ending. The episode's threads link together wonderfully through character relations, and that helps form it into a satisfying whole. It's the eighth enjoyable episode out of 10 by my count, bringing the quality ratio to 80 per cent. This is where the quality ratio concept I've used on the blog over the years struggles. It's a system that favours long-running story arcs, since there will usually be enough rolling over from one episode to the next to satisfy the viewer. Something like Star Trek: The Next Generation, with its relatively self-contained stories, will struggle by comparison. The truth is that Outlander is generally a very entertaining series, but the quality ratio cannot capture how frustrating it can be with the threats of assault going on all the time.